One of the factors that influences the sound of the TS is the opamp in use with its particular characteristics and limitations. Opamps are known to clip in a rather hard and unmusical way, and also have very high open loop gain which sometimes generates unwanted ringing and artifacts that arise when nonlinear components are present, like the diodes in the feedback loop of an OD. In the context of the FX-X contest of August 2006, we decided to implement the venerable TS based around the CD4049UBE logic IC since its amp stages, when used in audio applications, are known to clip softly and have moderate gain, typically in the order of 30 to 100 times, as opposed to the usual 100000+ of an opamp. 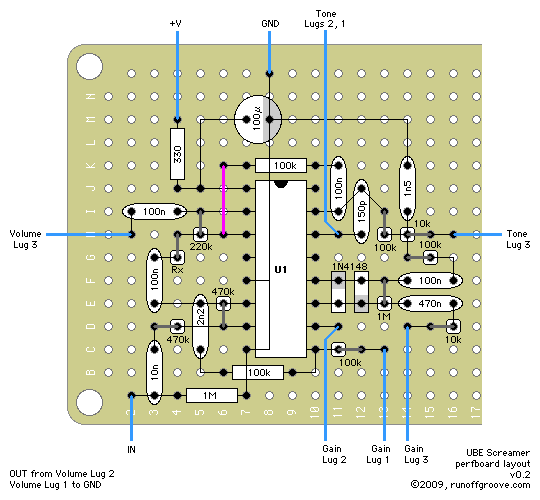 For the sake of clarity, the CD4069UBE IC can be used as well with equally pleasing results. The result was an overdrive pedal that has some air of the original TS, but with more attitude and character. The gain control is very wide, ranging from almost clean, to light OD, to moderate OD to a nice and full distortion. At minimum gain, there isn't as much bass loss as in a real TS, which is a good thing if adding a little dirt or pushing a tube amp is desired. The tone control provides great control over the sound, and at maximum it allows the signal to pass nearly unfiltered, contributing to the transparence of the pedal at low gains. The input buffer U1A was set up for unity gain and an input impedance similar to a TS. The audio is divided in two paths, the upper is the distortion path and the lower is the clean path. At the end of the circuit both paths are mixed. In the distortion path, the 2n2 and 100k provide a low filtering corner frequency of 718 Hz, just like in the original TS. As it can be seen, the clean path is not affected by this filtering, which is also true in the original TS. The original opamp gain is obtained with two series amps (U1B and U1C), since a single stage is not enough to attain the 200x to 250x gain found in a cranked TS. The gain pot arrangement is optimized for varying the gain incrementally in both stages simultaneously. The first gain amp U1B varies its gain between 1x and a modest 6x, as the intention here is to avoid clipping as much as possible in this stage, so it actually takes place in the diodes of the second gain stage. The second gain amp U1C has the clipping diodes and provides most of the gain (which ranges from 2x to aproximately 50x). The usual 47pF capacitor placed across these diodes was purposely removed as this stage doesn't have as much bandwidth as an opamp, and anyway the filter stage can provide plenty of filtering if desired. The tone section is implemented around U1D. It is an inverting 2nd order low pass filter whose 3dB cutoff frequency can be varied between 1kHz and 10 kHz with a single pot. According to our knowledge, this tone control arrangement has not been used anywhere else and was developed as part of this work! This is an important deviation from the original TS, as this circuit is capable of better filtering the high frequency harmonics. Also, we have boldly left the clean path out from the filter stage so as to avoid mudding up the signal when strong harmonic filtering is applied to the distortion path. As a consequence, the tone control doesn't have much effect at minimum gain, however in this condition we usually want the sound to be as transparent as possible anyway. Finally, the output buffer and mixer built around U1E provides an extra 2x gain so the circuit has plenty of output signal. Apart from the universe of clipping diode changes and the high-pass filtering R-C components on the distortion path, Rx could be replaced with a trimmer or pot. Also, the Vdd resistor may be adjusted for subtle and not so subtle changes in the overall sonic quality of the circuit. When using a CD4069UBE without this resistor, the current consumption is as high as 22mA. With 330 ohms, current consumption dropped down to 7-8 mA and voltage on the Vdd pin was reduced to 6.5V. A 1k or 500 ohms pot could be installed to starve the circuit at will - this control can be labeled VARIAC, if so desired. Listen to the UBE Screamer! UBE Screamer by runoffgroove.com is licensed under a Creative Commons Attribution-NonCommercial-ShareAlike 3.0 Unported License.